Let’s see, my buzzy friend. You hitched a ride in my car with me to California last month, survived a blizzard, had fun at Disneyland with my daughter and her family, and then you hung around with me while I was sick and being a most unpleasant house guest. That’s where we left the story last month. In the evenings we talked, ate, and drank wine, and I learned things about my kids’ teenage years that I’m probably glad I didn’t know at the time. If any of you readers have young children, your day will come! Usually when I hear these stories I nod wisely and say “We knew more than you think we did” which makes us look omniscient and makes them think they never really got away with anything. You might save that little gem for later when they tell you stuff that makes your hair stand on end. From there I made my way north again. Since my poor grandchildren had been stuck with “Gross Grandma” for two weeks while I was sick and crabby, I had to try a little damage control. I was heading to my cousin’s in Oregon, but had enough time to put on makeup and curl my hair and sweep through Redding with a gift for each child. See? I can be “Fun Grandma!” I brought Taunee the Ken doll she wanted badly. I was there less than two hours, but by the time I left Ken had hooked up with Barbie, was sweet talking her, and they’d produced a baby. That guy works fast!! I was off and running again, north to Oregon. More good food, wine, and a comfy bed at Cousin John and his lovely wife Kathy’s home. I could really get used to having others cook for me! After a couple of days of pampering, I felt good enough to head home. 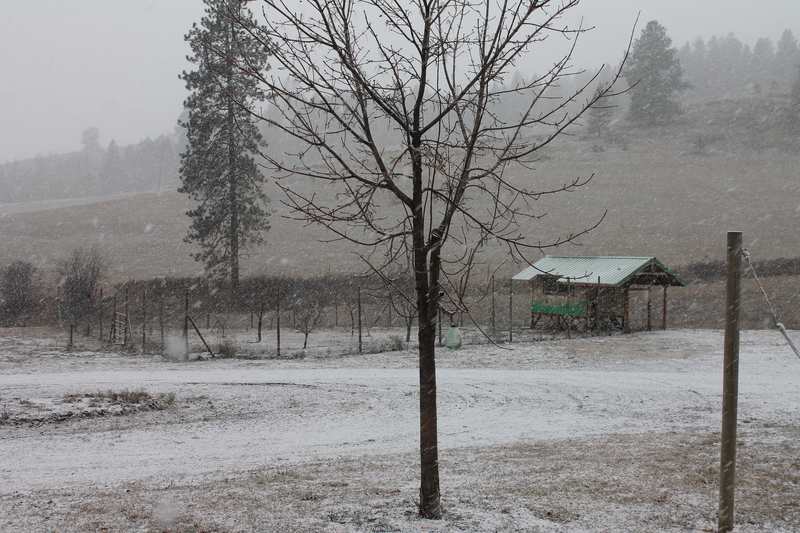 Luckily, the weather was delightful and I had long (12 hours) but uneventful drive home. Yes! I know I was happy to tumble out of the car at home, and I’m sure my little fly companion was too. I came home to a clean house, dinner in the oven, and a relieved husband. Sweet. Really? That’s all you’ve got?! And, while I have eggs on my mind, The Man came up with an idea for little cakes that turned out so cute. 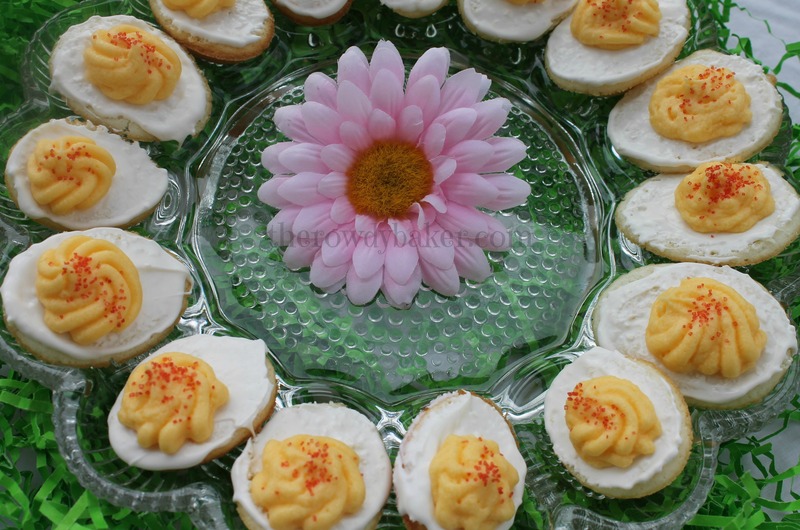 Here’s a link to my blog for Deviled Cakes. I’m going to put them on the table during our Ladies Spring Tea next month and see the funny reactions. Maybe I’ll get a couple of good pictures for next month’s Fly on the Wall. Yes, these really are CAKES! I love winter, and I love spring, but I really dread this in-between mess. Beware the Ides of March, indeed! Easter candy is my most uncontrollable guilty pleasure. When the kids were little I’d buy tons of candy for “decorating” but would put the boring stuff like jelly beans and salt water taffy in the cute little bowls and hide the good stuff for myself. The Reeses peanut butter eggs, Cadbury mini-eggs, Russell Stover marshmallow eggs…all were stashed in closets, or sometimes in the freezer disguised as bags of “broccoli”. I know, I know…I’m unspeakably ashamed. My children will probably end up on an analyst’s couch one day talking about how withholding their mother was. I admit I had a carton of marshmallow eggs hidden in the baking cabinet this year, but for the most part, I’ve gotten so much better about sharing. I HAVE! Speaking of Easter, every year I make sugar eggs. I don’t know why, exactly; it’s just an urge. 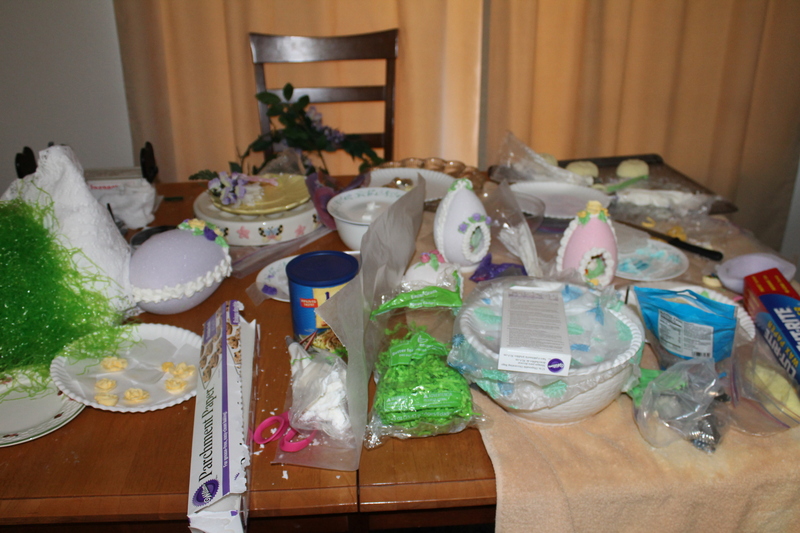 Bags of icing of every color, sugar eggs in various stages of completion, sugar egg carcasses that bit the dust…my dining room table craft table is covered with debris. Rather than clean it up, I have convinced myself that I must make more sugar eggs. There’s no sense in cleaning it up if I’m going to make more, right??? Um. Anyone want an egg? Hooooeeeeee. Did I do that? 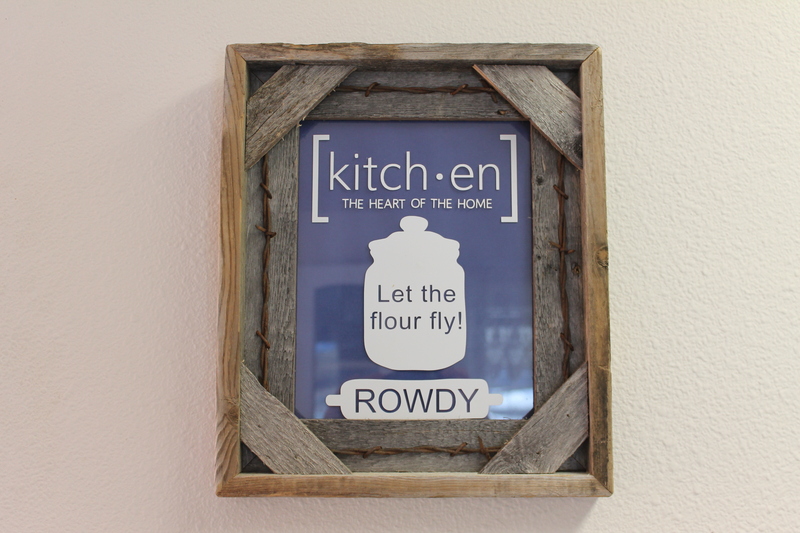 Right now there is more sugar flying than flour, but still…I love this gift my daughter made me! That’s it for me. It’s been a pretty dull month here. My youngest son (aka: Lord Voldemort) will be here next week, so I should have some good stories to tell. Until then, try buzzing around these other homes and see what’s happening! This entry was posted in Fly on the wall and tagged fly on the wall, small chicken eggs by Lorinda. Bookmark the permalink. Lorinda, Those cakes are adorable! 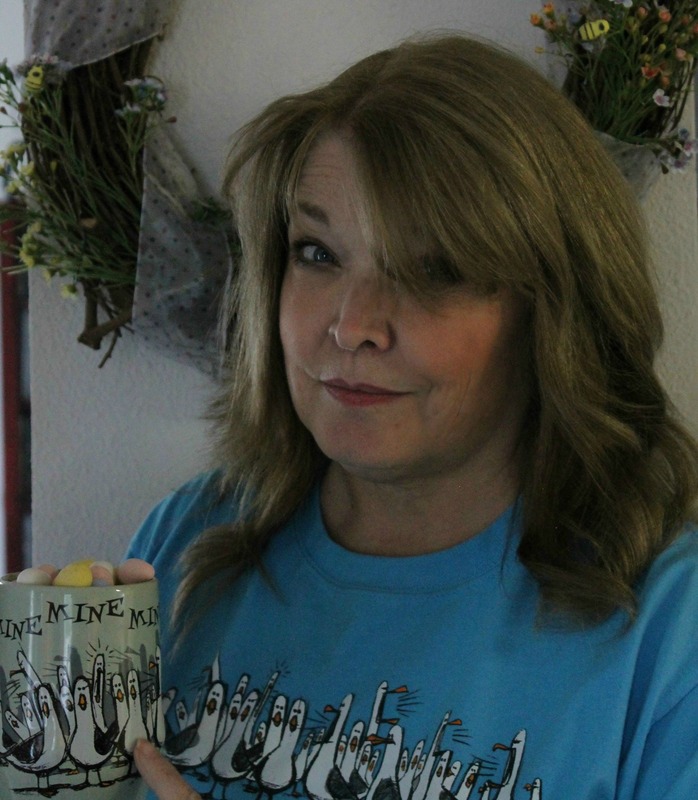 I love deviled eggs and cake, so really, I couldn’t go wrong eating a plate of either one. I want to see pics of the finished sugar eggs! 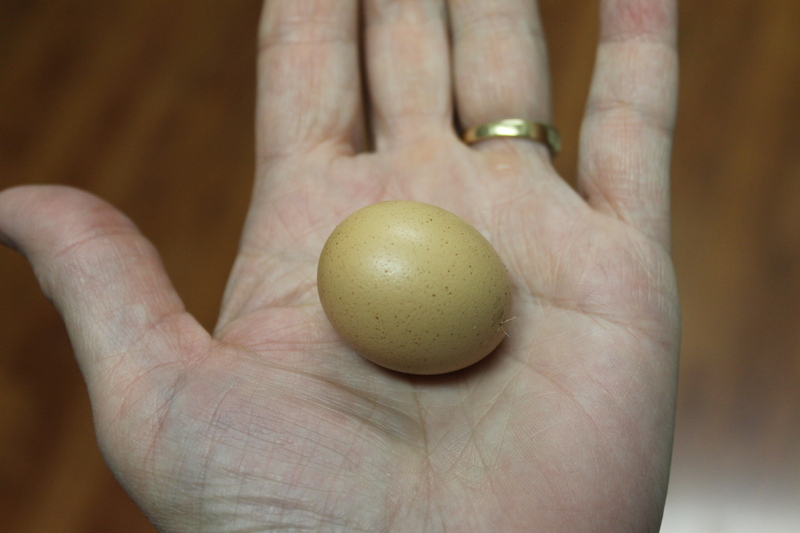 We’ve decided the egg was from one of the young girls (their first eggs are usually small. Not THAT small, but small.) She probably didn’t start laying last fall like the others. A slow bloomer? I love reading your fly posts. Those Devil Cakes look yummy!!! Thanks, Sarah! The man is going all chest-thumping on me because he thought of them. They were tasty, though! What an awesome gift from your daughter! Those Deviled Cakes are just fantastic! They are do dang cute! I’m glad you survived your trip and managed to be the fun grandma after feeling so yucky. I’m dying to see your sugar eggs. They have to be adorable because everything you do turns out amazing. Those cakes are SO CUTE!!! I am definitely going to have to try them out!!! There has to be a decent amount of time between the actual situation itself and the telling of it. It’s been about 15 years, which is long enough for me to deal with. 40 years would be better. I earned all this gray hair! Should I admit that I don’t know what sugar eggs are? I LOVE that gift from your daughter. So thoughtful! They’re also called panoramic eggs. Hollow eggs made of sugar with scenes inside. Messy to make, but worth it! Snow, travel and cake “eggs” LOVE those. Our hens would go through cycles of not laying, especially in the winter, they need 16 hours of daylight to produce an egg. We went through a long rainy period last spring and they didn’t lay for over 2 months. Ours lay pretty well in the winter. We have a heat lamp in the hen house and a full spectrum daylight bulb that comes on early in the morning. But…the older ones are about done laying. Now comes the hard part! I think I saw your Deviled Cakes on Pinterest… if not, they’re headed on to my cake board. Too cute! Kind of like your shirt, BTW. I want one… MINE! You probably did – I was trying hard to get them to take off on Pinterest. I think people just glanced at them and saw deviled eggs and didn’t stop to really look. I just got the shirt in Disneyland. Couldn’t resist; the gulls were my favorite part of Finding Nemo! You know, I think if we only had a few chickens they would just get retired and live as pets, but with 19 of them, you don’t get quite as attached. I do have a couple of favorites, though. I think they’ll be safe. oh man I’d love those deviled eggs…My hubby would love that plate of bacon and one egg, LOL. what a great gift from your daughter. Thanks, Karen! 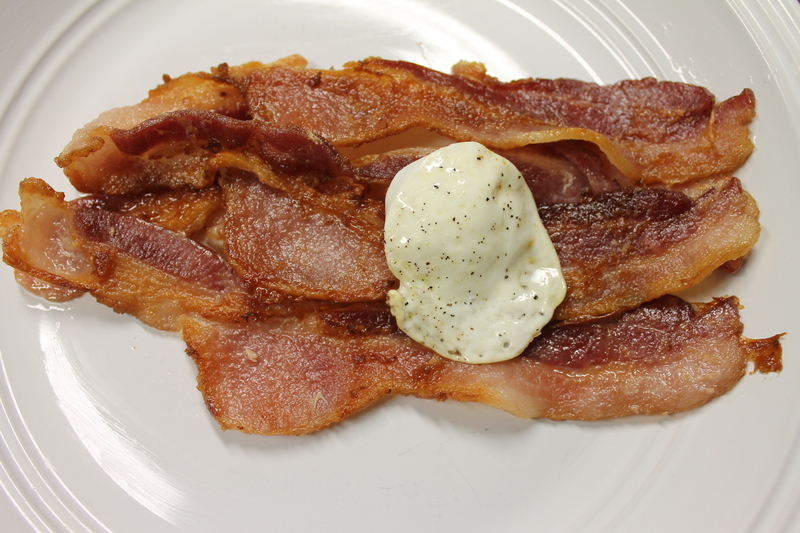 Yeah – that’s my kind of ratio too…4 pieces of bacon and one little egg.